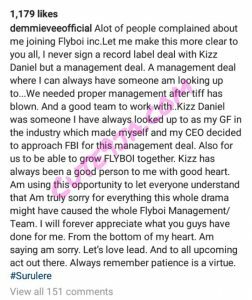 Nigerian singer, Demmie Vee has revealed that he never signed a record label deal with FlyBoi Inc owned by Kizz Daniel but a management deal. He made this known on Instagram as the beef between him and Kizz Daniel continues to brew. “Alot of people complained about me joining Flyboi inc.Let me make this more clear to you all, I never sign a record label deal with Kizz Daniel but a management deal. A management deal where I can always have someone am looking up to…We needed proper management after tiff has blown. And a good team to work with..Kizz Daniel was someone I have always looked up to as my GF in the industry which made myself and my CEO decided to approach FBI for this management deal. Also for us to be able to grow FLYBOI together. Kizz has always been a good person to me with good heart. Am using this opportunity to let everyone understand that Am truly sorry for everything this whole drama might have caused the whole Flyboi Management/Team. I will forever appreciate what you guys have done for me. From the bottom of my heart. Am saying am sorry. Let’s love lead. And to all upcoming act out there. Always remember patience is a virtue. #Surulere”. Just Think of Everything you love.Newest photos, up to date news and gossips – all in one place. Tajudeen is a journalist, blogger, writer, a social media and enthusiast.